The Dragonfly is an add-on handbike for manual wheelchairs. It uses 4 self-locking ball-joints for quick and easy attachment. Dragonfly users will benefit from the enhanced biomechanics of hand crank propulsion, thereby allowing for greater range and speed. The Dragonfly is designed primarily for outside use. Due to its small turning radius, it can also be used indoors in, for example, public buildings, shopping malls and rehabilitation centres. 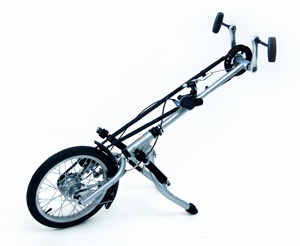 The Dragonfly is developed by Rio Mobility in San Francisco. The mounting and removing of the Dragonfly is done quickly and easily. The Dragonfly fits on most wheelchairs. The Dragonfly has an 8 speed transmission.